I haven't seen this movie yet, but I've read part of the book. I've also been to this little island of Virginia called Chincoteague. It is a wonderful place and I'd definitely love to go back. I love this movie especially love Misty and Phantom (The main characters). My fave horse movie! A few things are different from the book but its mostly the same. Personally I think its just as good as the book. Someday I hope I get to go Chincoteague. It's so pretty and I love the ponies! This movie is great but it's not exactly like the book. But I love it anyway! Phantom, Misty, and Maureen are my faves. Love Horses! if i had to rate this movie in a scale of one to ten it would be 1164628655939189!! did anyone know that the foal that play misty was actually black and the people had to bleach it? It was an exciting story about the round up on assateague and them spotting the mysterious phantom. But what is trailing along beside her but a brand new colt. Will they have what it takes to keep them both? It is an exciting thriller about a boy and a girl trying to get the two horses they want. I have my own pony of Misty's breed. He is perfect for beginners and is amazing! I love these ponies! It's like a wild dream, but on a Movie. Ok I got this movie for easter and I loved it. It was actually a very accurate account of the book up until the end when they got some details wrong, easily fixable though. Only other thing would change is that the phantom didn't have her "map". I loved tho movie and it was very similar to the book! I have seen the movie a thousand times. It is soooooooooo good. A really good book and A.W.E.S.O.M.E movie. If you like horse movies and horse books this is the one you MUST have! i read the book. where is it? i totaly WANT TO SEEEEEEEE misty. i am a horse crazy person, im soo horse crazy and animal crazy that i practically live on a farm!!!!!!!!!!!!!!!!!!! i have 2 horses, 6 geni hens, 2 cats and a dog german sheperd that is a puppy. this movie is good but sad. ILI stands for I love it! Best movie ever! I loved the books and the Breyer models, and the movie was even better! I love when the directors stick to the book, it makes it twice as good! They did a good job matching all the horses except one, Misty's dam, Phantom. But all in all, it's a great movie! 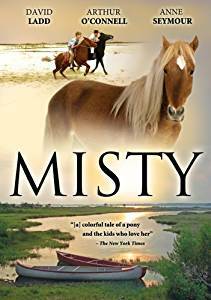 I've read books by the author of "Misty" ("White Stallion of Lipizza" was mind-blowing) and loved them. This looks great. My own horse looks an awful lot like Misty - she just has a stripe where Misty has a star! there's this miniature pony (it's tiny) at my stables called Misty and she's so cute!